Tyrosine is one of the amino acids that play a big role in a number of physiological processes. They are precursors for some hormones and neurotransmitters essential for the the body to conduct metabolic functions. In this article, the chemistry of tyrosine will be discussed. The article will answer how it is metabolized to produce the different hormones and neurotransmitters. Tyrosine is one of the nonessential amino acids that the body uses to synthesize polypeptides or proteins. It has a polar side group and is produced when the body processes the amino acid phenylalanine. It is essential in producing several neurotransmitters like epinephrine, dopamine, and norepinephrine. They also help in producing melanin, which is the pigment present in the skin and hair. It is also used in the regulation of several hormones including the thyroid, pituitary and the adrenal. Tyrosine can be derived from casein, a protein found in the milk or milk products. Tyrosine and phenylalanine pair together resulting in the formation of amino acid pair. Phenylalanine cannot be not synthesized by our body so, it must be consumed in food. WHO has recommended a daily intake of phenylalanine and tyrosine as 25 mg/kg of body weight. The phenol group in the structure of tyrosine affects the different functions it can serve. It can serve as a part of the signal transduction processes. It can function as a receiver of phosphate groups where the attachment is catalyzed by protein kinases. The activity of the target protein will be affected, when the phenol group is phosphorylated. In plants, tyrosine plays a major role in photosynthesis. It acts as an electron donor in the reduction of oxidized chlorophyll. In the process, the hydroxyl group of the side chain is lost. Tyrosine can be metabolized to produce the different neurotransmitters., L-tyrosine is the isomer of tyrosine which is naturally occurring tyrosine. In the first steps of the metabolic process, L-tyrosine is converted to levodopa using tyrosine hydroxylase as enzyme and tetrahydropyridine as a co-factor. The levodopa is further decarboxylated to produce dopamine with the help of Dopa decarboxylase as an enzyme. The dopamine can then be further oxidized using Dopamine beta-hydroxylase (dopamine beta-monooxygenase). The end product of hydroxylation is Noradrenaline. Noradrenaline can then be methylated with the help of Phenylethanolamine N-methyltransferase. The end product of this step is adrenaline.Tyrosine has the potential to pass readily through blood-brain barrier directly depend on the dietary intake as they get continuously metabolized to form dopamine and other neurotransmitters. Levodopa or L-DOPA is the precursor of the neurotransmitter dopamine, norepinephrine, and epinephrine. It readily mediates neurotrophic factors released by the brain and the central nervous system. It is sometimes produced as a psychoactive drug. It can cross the blood-brain barrier which dopamine cannot do. 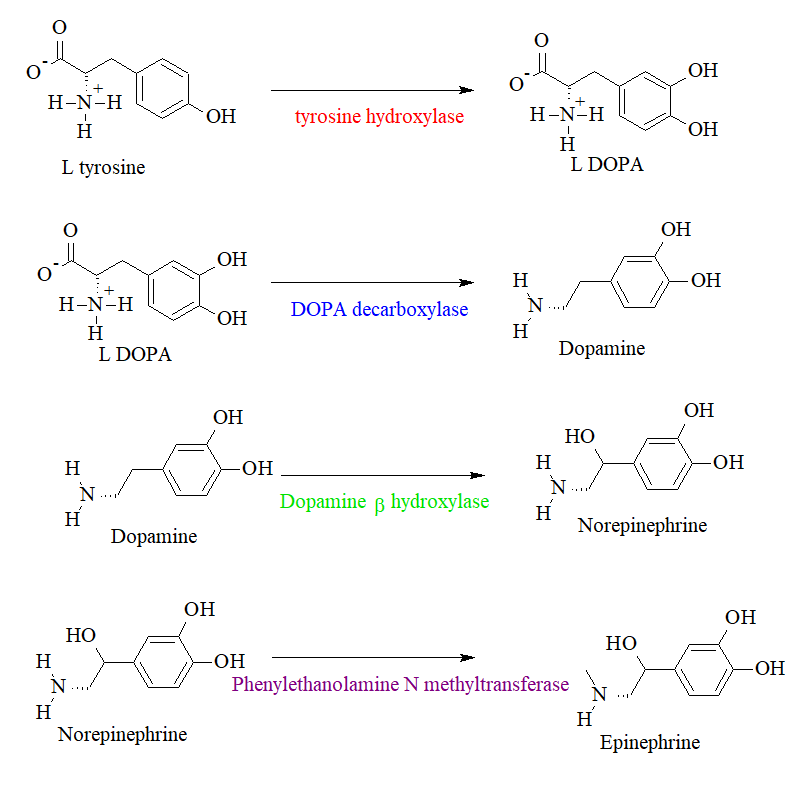 L-DOPA is being administered to patients with Parkinson’s disease and dopamine-responsive dystonia to increase the dopamine concentration in the patient. Dopamine is a neurotransmitter that plays a big role in reward-motivated behavior. Most types of rewards cause an increase in the release of dopamine in the brain. It also functions as a local chemical messenger. It sometimes inhibits release of noradrenaline and acts as vasodilators. Norepinephrine or noradrenaline is another neurotransmitter produced by the metabolism of tyrosine. It functions mainly to mobilize the brain and body for action. Its release is lowest during sleep and rises upon waking up. Its release is related to the fight or flight response of the body. Norepinephrine is responsible for increasing arousal and alertness. Adrenaline or epinephrine is a hormone or neurotransmitter produced by neurons and the adrenal gland. It plays a major role in flight or flight response by increasing blood flow in the body. In the process, the body becomes more active, the pupil dilates and blood sugar increases. Thyroid hormones are tyrosine-based hormones produced by the thyroid gland. They function primarily for regulation of metabolism. These hormones include triiodothyronine (T3) and thyroxine (T4). 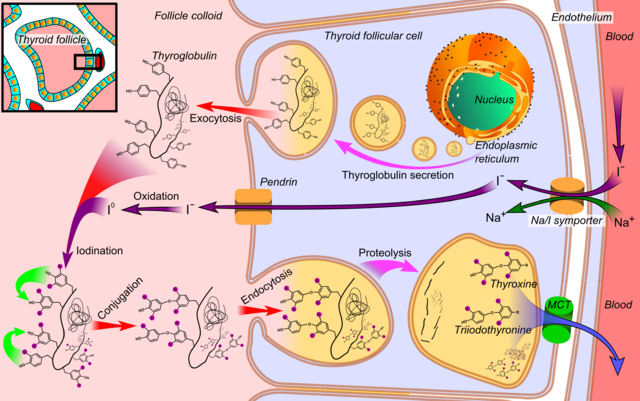 Thyroxine and triiodothyronine are both produced by follicular cells of the thyroid gland. They regulated by the thyroid-stimulating hormone. Thyroxine is produced by a series of steps in the follicular cells.The thyroid hormones are synthesized by oxidative coupling of the iodinated tyrosine residuals by catabolism of thyreoperoxidase in thyreoglobulin. First, the Na+/I– symporter transports two sodium ions across the basement membrane of the cell. Passing along with the sodium ions is an iodide. I– is then moved across the apical membrane into the colloid of the follicle. Iodide ion is then oxidized by thyroperoxidase. The tyrosyl residues of the thyroglobulin are then iodinated by thyroperoxidase. The iodinated thyroglobulin then binds to megalin for endocytosis back into the cell. TSH from the adenohypophysis binds to the TSH receptor to stimulate endocytosis. The endocytosed vesicle then fuses with the lysosome of the follicular cell which eventually cleaves the thyroxine from the iodinated thyroglobulin. One of the most common disorders related to tyrosine is tyrosinemia. It is a genetic disorder that is characterized by disruptions in the different steps in the break down of tyrosine. When untreated, the tyrosine and the by products of the whole process may build up in tissues leading to serious health problems. Type I tyrosinemia is the most severe of all the types of tyrosinemia. It is an autosomal recessive genetic disease caused by lack of an enzyme named fumarylacetoacetate hydroxylase, required for tyrosine metabolism. The signs and symptoms of this disorder show in the first few months of life. Infants with Type I Tyrosinemia fail to gain weight and grow. They experience poor food tolerance. Food rich in protein may cause diarrhea and vomiting. Infants also show yellowing of the skin and the white of the eyes. Eventually Type I tyrosinemia can lead to kidney and liver failure. Rickets or weakening of bones may also be experienced. The risk for liver cancer also increases. The diagnosis of Type I tyrosinemia is established by the blood tests that depicts an elevation in the levels of tyrosine in plasma. Confirmation of the disease is achieved by the presence of high levels of succinylacetone in plasma or urine. It is treated with nitisinone in more effective manner when treated in acute episodes and slow disease progression. Low intake of phenylalanine and tyrosine is highly recommended to save the liver and kidney. Untreated children often do not survive past age 10. Type II tyrosinemia is a less severe autosomal recessive type of tyrosinemia caused b deficiency of tyrosine transaminase, which affects the skin, eyes, and mental development. Signs and symptoms also show during the early years of life. Symptoms include eye pain and redness, photophobia, painful skin on palms and sole of feet. Almost 50% of patients with this type of tyrosinemia have some degree of intellectual disability. It is diagnosed by the blood tests and urine tests that show an elevation of tyrosine in plasma and absence of succinylacetone in blood plasma or urine. In liver biopsy. it is shown that there is decreased enzyme activity. It can be treated with a mild to moderate decrease in the intake of phenylalanine and tyrosine in the diet. The rarest type of tyrosinemia is Type III. It is caused by a deficiency of enzyme 4-hydroxyphenylpyruvate dioxygenase needed for the break down of tyrosine. Features of this disorder include intellectual disability, seizures, and intermittent ataxia. Another type is transient tyrosinemia, which occurs in about 10% of newborns with temporarily elevated levels of tyrosine in the blood plasma. The cause of transient tyrosinemia is not genetic. The cause of this type is Vitamin C deficiency or problems with liver enzymes due to premature birth. It is also diagnosed by blood test, urine test, and liver biopsy. The dietary restriction of phenylalanine- and tyrosine is helpful to manage the diseases. The correct answers can be found below the referenced. 1. Which of the following is not produced by tyrosine metabolism? 2. Which of the following types of tyrosinemia is not genetic in nature?